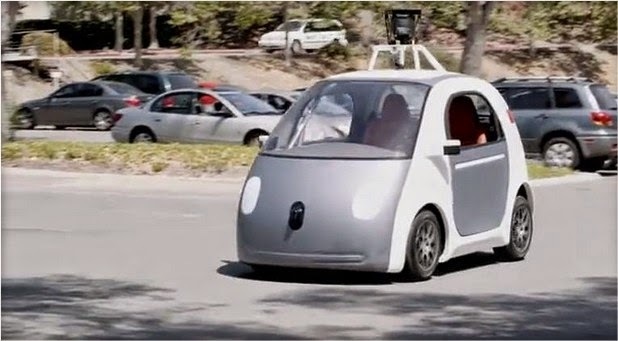 Google has built a self-driving car from scratch -- a vehicle that has no steering wheel or accelerator or brake pedals. A two-seater prototype of the vehicle was unveiled Tuesday by Google CEO Sergey Brin during an onstage interview at the Recode Code Conference in Palos Verdes, Calif. Instead of the car controls indispensable to today's drivers, Google's prototype relies on built-in sensors and a software system to safely maneuver the vehicle. "We took a look from the ground up of what a self-driving car would look like," Brin said. The goal of the project is for self-driving cars to be "significantly" safer than human-driven cars in a few years, Brin said. He said that the project has experienced no crashes during testing, but the cars only operate at speeds of around 25 miles per hour, which gives them more time to react to obstacles. Google's self-driving car is an ambitious project that hopes to end human error behind the wheel with a very Googley solution: software. The tech titan's robo-cars have logged more than 700,000 miles since it began working on the vehicles in 2009. Google expects to have them ready for public use between 2017 and 2020. A demonstration earlier this month by Google's Self-Driving Car Project team shows how the vehicle depend on a Google-made topographical map to get a sense of what it should expect. The map includes the height of the traffic signals above the street, the placement of stop signs and crosswalks, the depth of the sidewalk curb, the width of the lanes, and can differentiate lane markings from white and dashed to double-yellow. The company announced major progress last month in improving how the system responds to objects not on a map. In a YouTube video, the web giant demonstrated some of the circumstances its self-driving cars now handle, such as bicyclists signaling to move across a lane of traffic, railroad crossings, and parked cars protruding into the lane of traffic. While Google has been at the forefront of developing and testing self-driving technologies, it's not alone in its driverless vision for the future. Nissan, General Motors, and automotive supplier Continental expect self-driving cars on the road by 2020. Ford Motor Co. has unveiled a self-driving prototype car. Telsa Motors wants its system to handle 90 percent of driving duties by 2016 -- a more aggressive schedule and one that's more like what Google has said is attainable.